I hope the festive season brought all you desired wrapped in love, health and happiness. My biggest complaint; that it was not long enough, and I feel propelled into the New Year having not stopped for breath. Before Christmas my boys had a wonderful week of pyjama days, not emerging till late morning and thanks to CBBC entertained almost all day long. By evening, emotions, ennui and exhaustion were taking its toll on their weary bodies as bickering, banal banter and boorish behaviour broke out. That week, I worked hard. I ran round cooking, shopping, wrapping and delivering presents. The mountain of washing generated by three boys in their pyjamas was phenomenal. I met my mother on route to stay with my brother, to swap presents. Actually she had been organised enough to give me hers the last time we had met. I on the other hand had not actually bought mine then. Christmas Day we had a quiet intimate day. Following midnight mass, the hope the boys would continue to sleep late was a mammoth misconception. Having got them all to bed and waited till I could do my Christmas Eve creeping around I finally rolled into bed in the early hours of Christmas morning. Amazingly it was barely a few hours later when little feet crept into the lounge and sorted out how many presents had their name on. 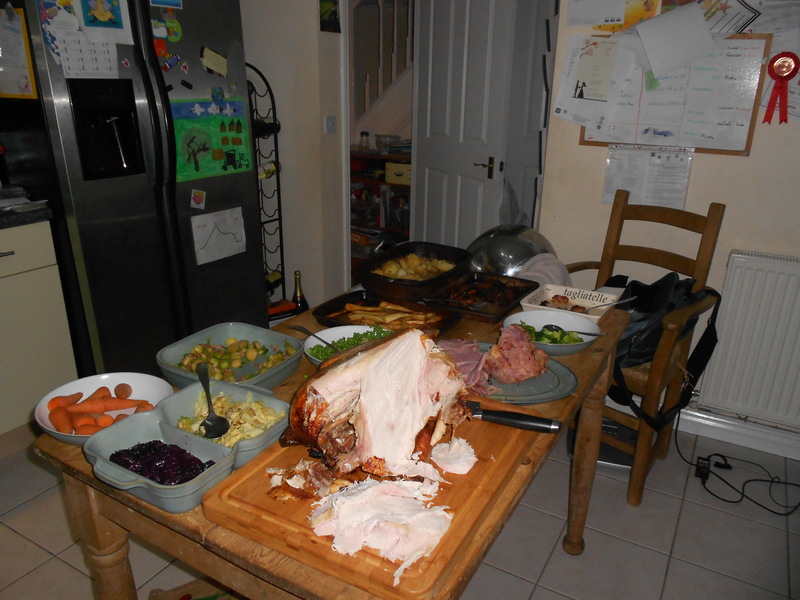 I was prepared; thanks to Nigella the turkey was bathed and cooked slowly overnight so was out of the way. The veg had been lovingly peeled and chopped in readiness the day before and a very rigid list had been prepared; starting with breakfast. Why then did I still spend the day in the kitchen slaving over the hot stove; and what is wrong with beans on toast? Next year I vow to go to the pub for Christmas Dinner. What is wrong with Baked Beans on Toast? We spent the next couple of days visiting family, which was where I was given Herman the friendship cake. I would put it in the league of how to lose friends and upset people. Apparently on the continent you give them instead of Christmas cards; imagine if you have a lot of friends. Herman is a cake mixture which you are supposed to stir each day, talking to it. On day four you feed it then continue stirring till day eight. You feed it again, divide into 5 portions, the first of which you cook and eat. The other four portions you give to your friends who covertly curse your generosity. I have to confess; I accepted it grudgingly but resolved to do my best by it. The first days I could be found stirring and talking to a bowl! Day four I did stir but forgot all about feeding. Day six and seven I forgot to stir or talk and Herman stuck together. The thought crossed my mind that I should feed him but Herman was not salvageable. He was sent with other excess food past its edible date to the great compost heap in the brown bin. This led to one of my more inspirational resolutions for this year: the word is no! I am resolved to try to learn the word no, to use it and to allow others the opportunity to say yes. Saying no will probably be far harder than the usual getting fit, losing weight and writing; some of the other resolutions I have again signed up to. Returning to work my resolution ringing in my ears; the word is no! The word is no. I discovered my colleague is yet again signed off sick possibly only for one week but most likely for three. Would I cover her workload; pay outstanding invoices, advertise for staff, all as quickly as possible. The word is n-n-n n-n-n – well what was I supposed to say? She has been off sick having had multiple operations over the last two and a half years and I get pulled in to cover each time. She never even made it back full time between these last two operations. So who has kept their resolution? On my list I was going to walk 1 km a day, it wasn’t far I know but in preparation of my friend and neighbour Natty who is planning to get me jogging again. Last time I jogged safely was pre-complications that originated from caesareans. I had managed my walk until yesterday when I ended up staying late at work, meaning I was running late to do the shopping. Oh well there was the 100 words; I wanted to write 100 words every day, to help get back into the discipline of writing. I did very well earlier in the week, then yesterday knowing I only had to work the morning I left it till the afternoon. Being the first day back the morning was stressful enough. Guess what; I was late back from work, didn’t have enough time to do a proper shop and hence never got to do my 100 words. There is always the healthy eating resolve. Unfortunately yesterday I ended up working till late with no lunch and being the first day back no nibbles in the staff room. I came back starving and late, so I grabbed a few chocolates from the tin, you know the ones that get left as nobody really likes them. I finished the three half biscuits in the biscuit jar and grabbed a glass of weak squash all that was left in the bottle, to keep me going. Having done the shopping and spent far too much because I was hungry and everything looks so much better, I got home and collapsed on the sofa with a cup of tea and Christmas cake. So much for saying no! I have however, resolved to overcome my big fear about sending out my story; Memories. I picked three very dear people who like the friendship cake may not appreciate my generosity. They have supported the story from the beginning and all three had read and commented favourable on the first three chapters, so I sent them the story. It took me two hours to send it. The body of the email got longer and longer till it was nearly a book in itself, I scrapped it and began again. I procrastinated, prevaricated and paused several more times before plucking up the courage to finally press that send button. I hope they will come back with some glimmer they think it is worth pursuing with. So having broken only my first resolution it resulted in the domino effect on all the other resolutions. What about yours? Have you made any and have you managed to keep them going longer than a few days. I have managed to write at least 1 word this morning – just popping off to do my 100 km walk or maybe it is the other way round!